CostingNet is used to create a detail product costing sheet. Best for factory or manufacturer in industry like garment, clothing, apparel, toys, home textiles, giftware, premium goods, household product, footwear, bags, luggage, plastic products, electrical & electronics, travel and sporting goods. Web remote access feature: maintain operation during outbreak since employee can work away from office individually. Risk management solution for your staffs and business. 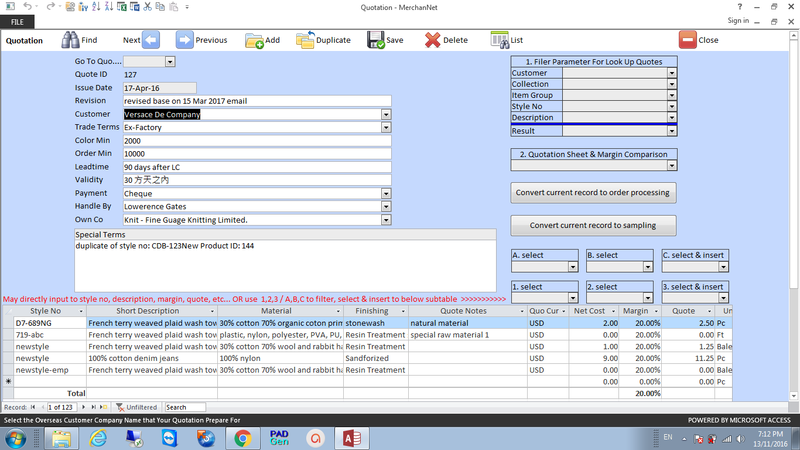 Quotation modules issue quotes to customer, create cost Vs quote analysis report by different grouping - by customer, collection, item, brand name and description. Also maintain product cost and quote price, which is used to find out the cheapest product cost and most generous customer, hence benefit sales and profit margin. Meantime, by quoting an exactly acceptable price to customer in order to get order confirmation. Multi languages with Chinese / English Bilingual interface and reports, more applicable for multi-national companies with business association with China. Remote Access CostingNet Database over internet, able to view record details from overseas. (with user's own Window XP or Server) Multiple user access to the database at the same time. Workgroup and multi-user functionality. User right limitation restrict junior staff reading sensitive figures and report. Trial logon username:demo password:123 require microsoft access 2007 runtime to run http://r.office.microsoft.com/r/rlidAccessRuntime activation key required Starting from version 4.28 onward user is able to made their own change on the design. please click start > all program > CostingNet - Design (shortcut) to open the software in design mode. however, user must have their own full version of MS Access 2007, 2010 in order to do so. In this case, user can simply change the design layout of all the report or input form format. Whatever field titles, field width, field length, position.